Fan speed controller or low ambient fan controller is a control that is used to control the fan speed of the air-cooled condenser in a heat pump direct expansion system. Heat pump is used in temperate countries and can be used to operate in cooling or heating mode. When used as a heating mode in winter, the indoor coil acts as a condenser and outdoor coil as evaporator. When the unit is set to cooling mode in summer, the indoor coil will operate as an evaporator and the outdoor coil as condenser. This is accomplished by the use of a 4-way-valve that reverses the flow of the refrigerant in the system. In the United States, usually when the reversing valve is ON, the system will operate in cooling mode and when it is OFF, in heating mode. When the outdoor ambient temperature is low such as 50°F(10°C) or below, we will usually want to run our heat pump in heat mode to heat up the room to maintain a comfortable temperature for the human body. However, there are instances in which we want to operate the heat pump in cool mode even though the outdoor surrounding temperature is low. These places may include the followings. Data centers or server rooms where all the information technology equipment need to have a cool and stable temperature. If we continue to operate the heat pump in cooling mode, the head pressure will drop. The expansion valve needs a certain head pressure to operate properly and if the head pressure continues to drop, it will cause the air conditioning system to stop operating. As a result, the evaporator will freeze-up and compressor slugging will occurred. Compressor slugging is caused by the entry of liquid refrigerant into the compressor's cylinder during operation. It will damage the valves, bearings and other mechanical parts of the compressor. 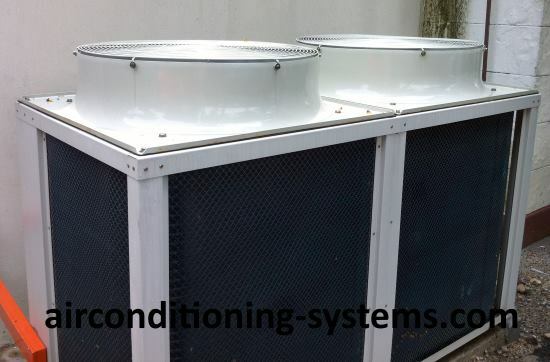 The solution to this problem is to install a fan speed controller that will be able to regulate the speed of the outdoor fan of the condenser. In order to use the controller, check the specifications of the fan to ensure that the fan is able to be modulated by changing the supply voltage to it. A sensor will be mounted on the liquid line of the condenser where its temperature is used to control the speed of the fan. By regulating the speed, the head pressure will not drop too low hence the heat pump will still be able to operate in cooling mode even though the outdoor ambient temperature is low. Look and compare the features of a fan speed controller before buying it. In cooling mode, the hard start feature will be available in which the output voltage to the fan will be at its maximum during the first few seconds to ensure proper rotation of the fan. After that, it will be regulated based on the outdoor ambient temperature. In heating mode, there will be no regulation of the output voltage. It will operate at its maximum line voltage. Adjustable rotation of the speed in the field based on the condensing temperature. Rating of output current. Some can go up to 10A. An isolated input(such as 24VAC) to power up the controller is a consideration for safety requirements.